This is an excerpt from an article originally published in the Louisiana Weekly. Read the rest here. Louisiana is renowned for its musical families, two of which are highly represented in this year’s Grammy nominations. They include vocalist/keyboardist PJ Morton and accordionist/vocalist Dwayne Dopsie whose fathers are both recording artists. PJ Morton, the son of Bishop Paul S. Morton of the Greater St. Stephen Full Gospel Baptist Church Choir, is in the running for his wonderful album, Gumbo (Morton Records), in the competitive category of Best R&B Album. Morton has also been nominated for his talents as a composer in the songwriting division for his tune “First Began,” that opens the album. A part of the beauty of “First Began” is that the lyrics, simply presented, are so universal and easy to relate to – many people have been there. Morton retains a certain element of his church background whether he’s presenting soul or rhythm and blues numbers. His sense of humanity remains at the forefront. Beyond their deep roots in the music and the culture in which they were raised, PJ Morton and Dwayne Dopsie seem to have an affinity – at least on their two nominated albums – for short tunes, the three-minute or so variety that, in the past would have fit on a 45 rpm record. It works. Morton’s nine-selection album comes in around 30 minutes. Like Morton, Dopsie also relies almost entirely on original music for his and his band’s, The Zydeco Hellraisers’ Grammy-nominated album Top of the Mountain. It’s up for the award in the Best Regional Root Music Album category though, unfortunately, it will be competing with another Louisiana group, the modernly-bent Cajun band, the Lost Bayou Ramblers, that got the nod for its release, Kalenda. 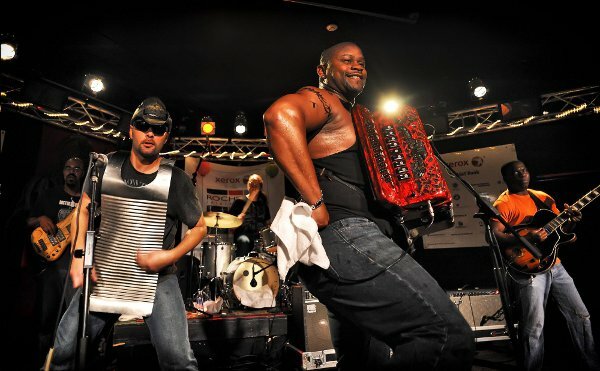 Dwayne Dopsie is the youngest son of the late great accordionist/vocalist Alton “Rockin’ Dopsie” Rubin, who earned two Grammy nominations – in 1991 for Louisiana Man and in 1989 for Saturday Night Zydeco. Dwayne’s Top of the Mountain, an incredibly lively album, shows the leader exploring the history of zydeco music – yes, he even sings in French patois – and following his dad’s journey into reggae rhythms on his rhythm and blues ace, “Gotcha Baby on My Mind,” that’s complete with a horn section. Dwayne, like his father, is a joyful musician who has found his style and rolls, full-heartedly with it. In both cases – Morton and Dopsie – it’s easy to say, like father like son in talent and spirit. Another Louisiana artist, slide guitarist Sonny Landreth, is also in the running for a Grammy. A native of Mississippi who landed in Lafayette, Louisiana and is now a resident of Breaux Bridge has been named for his Recorded Live in Lafayette in the Best Contemporary Blues Album category. This article originally published in the December 4, 2017 print edition of The Louisiana Weekly newspaper.